Holm used it time and time again to devastating effect - both moving to the outside of Rousey's lead (something I'll examine in a moment), and sometimes just square down the middle on the inside, as shown in the three pictures to the right. However it lands, the technique is devastating. It's a very useful punch precisely because it is so unexpected. I suppose this raises the question why that would be the case. I'll get to that soon. 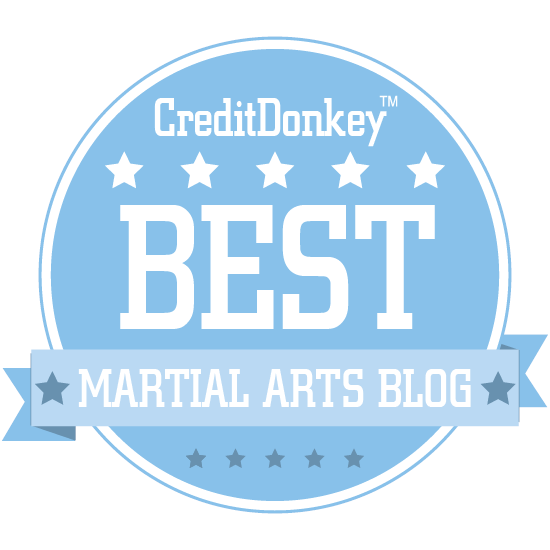 But first, let us not forget what an oddity this technique really is - in both combat sports and traditional martial arts. In an industry often obsessed with rejecting any level of "corkscrew" in punches, it seems out of place to expect one that corkscrews to its maximum possible extent - ie. so much that the thumb ends up pointing down. It seems even odder to see it used to such a manifestly effective manner. 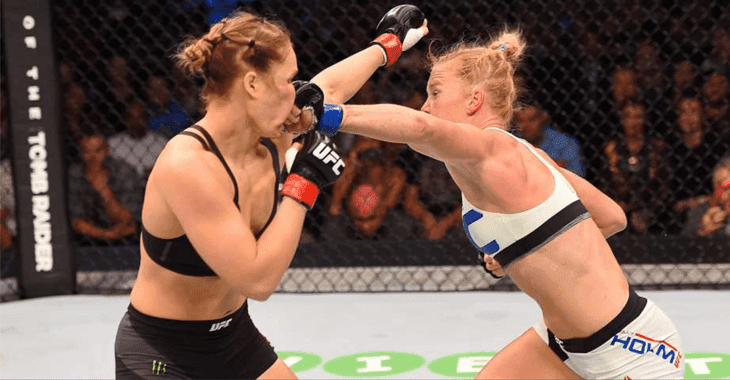 Yet there it was in the Rousey vs. Holm fight: a punch that didn't just corkscrew a little; it corkscrewed to the very limit! 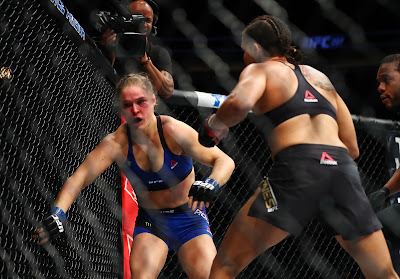 And Rousey seemed to fall into it repeatedly. What I think this shows is that any form of dogma regarding the "corkscrew" is just that: dogma. It is unproven theory at best, blind ideology at worst. Such thinking ignores common sense, as I noted many years ago (see my original article here) and misses out on many useful applications. Twisting your arm in a punch, deflection or any other movement is going to happen. And it is often going to be useful - whether it is because it adds torque, cuts a unique angle (eg. 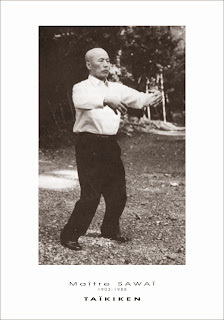 xingyi's heng quan) or is simply the most natural movement in the context. 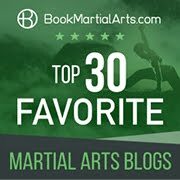 What makes the overhand inverted punch a particularly useful variant is that, unlike a hook or even most cross punches, it is defaults to a motion that is more or less straight. A hook necessarily circles in from the outside. A straight cross follows the hypotenuse of a triangle from the outside. But the overhand inverted punch doesn't approach from the outside. To the extent that it "circles in", it does so from above. Otherwise, in terms of lateral movement, the punch is really coming in straight. As a variation this can be most unexpected. Moreover it can be thrown with considerable force, using a high chamber to allow plenty of room for acceleration. Which brings me to the whole question of where the punch is most profitably aimed. 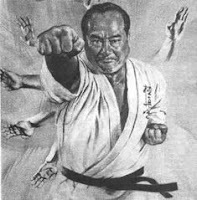 But it certainly occurs in the Chen Pan Ling taijiquan form - in 3 places, no less. All of those punches are aimed low. 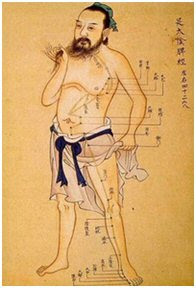 Indeed, the most notable of the techniques is simply called "step forward and punch to groin" (in some schools it is known as "old woman punches to the groin" which has always amused me!). As the name implies, the punch seems to be primarily aimed at the groin. Or maybe the bladder/kidneys/ liver/spleen. Or maybe the solar plexus or xyphoid process even. 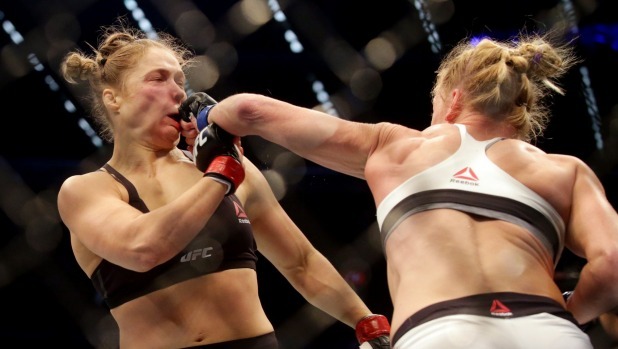 Yet in the recent Rousey vs. Holm fight it was used by the latter to great effect as a punch to the face. What gives? As I discuss in the video below, the answer lies, I think, in the fact that punch is a dropping punch. That natural curve we spoke about, coming in from above and raking down, is what matters (primarily). It isn't about "punching the groin". It is about counter punching with a falling moment. The benefit of this moment is that it can catch a variety of targets along the centre line as it drops - depending where your opponent is. The groin is, if you will, simply "where the bus stops" - the final possible target. Yes, the face is an excellent target. But as I discuss in the video, with an aggressive opponent who is entering strongly, you might not have enough room to accelerate the punch all that much if it lands on the face, as opposed to dropping lower down onto the body. Of course, you might not need to: your opponent's incoming momentum might well be sufficient (ie. you might be able to rely on that rather than your own generated momentum). But otherwise it is a matter of physics that if you have more room to accelerate your punch, you will reach a higher velocity on impact and generate a more forceful punch. 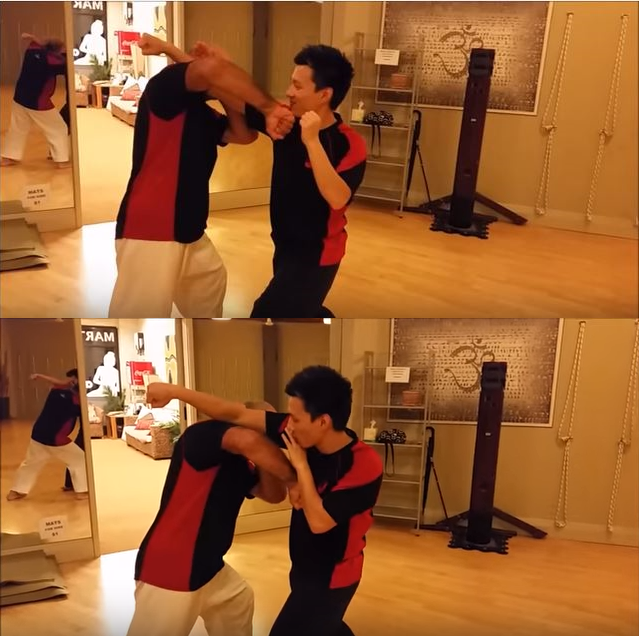 Compare how far Armando's arm has moved in the pictures below when comparing the face punch and the solar plexus punch. Consider the amount of shoulder he's been able to throw in too. And it's not as if low, overhand inverted punches of this kind are unheard of anyway. You see them all the time. 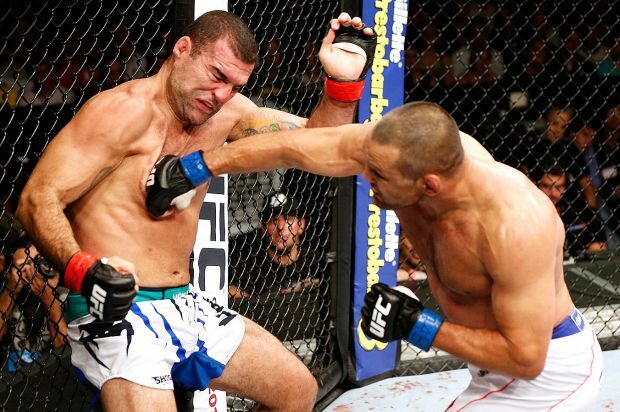 The might not even be intended as low punches, but end there after raking past the face. 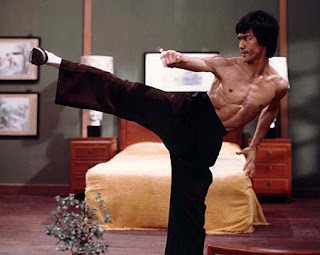 Anyway, that's my view on why the punch is aimed low in the Chen Pan Ling form - and why it is called "step forward punch to the groin": the final position is low - perhaps groin height (although even Chen Pan Ling in his textbook seems to finish at around solar plexus or tanden/dantien level - nowhere near the groin really). 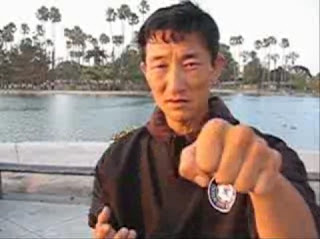 In other words, the punch is named, as many taiji techniques are named, by reference to their superficial appearance (particularly at the finishing point) - not their function. 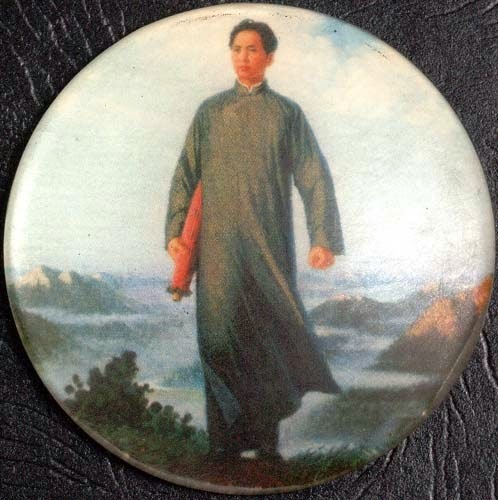 You'll note from the above video that the taijiquan application necessarily goes to the outside of a right. This is evident from the hand deflection accompanying the movement - if one follows the simplest and most logical interpretation (in my humble opinion!). This either means you're moving to the lead of a southpaw's lead jab or you're dealing with a right cross. Personally, I like to train it against the latter. In either event, you're moving to the outside of your opponent's right. 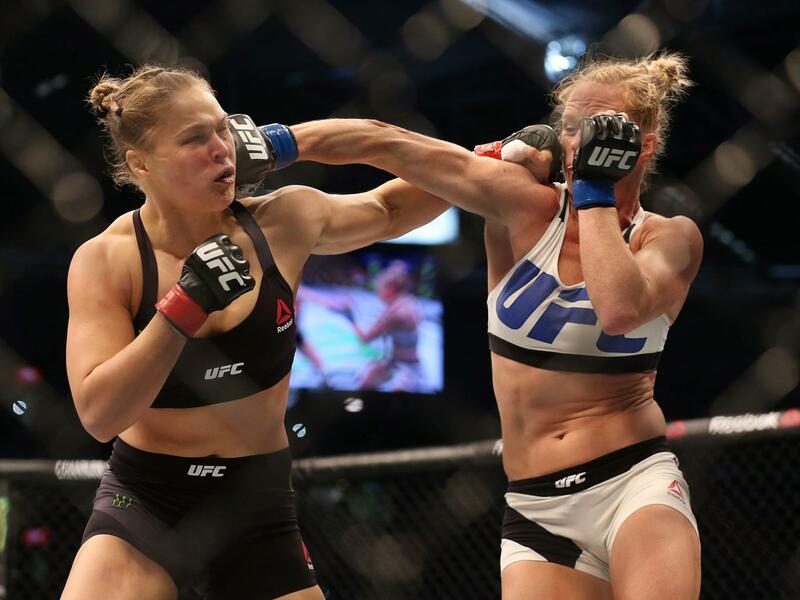 This is actually what Holly Holm did at least once to Ronda Rousey - albeit that as a southpaw, she moved to the outside of Rousey's left. And being a boxer, she relied purely on evasion, and not on evasion and deflection. Of course, the overhand inverted punch has many other functions too. Regular readers will know that I'm not fond of always interpreting blocks as throws, locks, strikes etc. That doesn't mean they can't be so used: I'm simply opposed to the ideology that interprets them primarily as something other than what appears to be their main purpose - defence. Ditto with punches. I believe they are primarily punches. This doesn't mean they can't be used for a whole host of different purposes - including deflections, locks and throws. 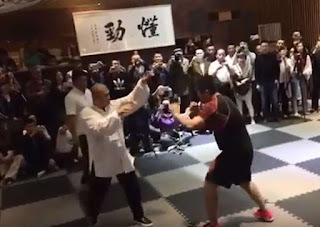 In respect of the last of these, you'll note from the video below that I interpret one of the overhand inverted punches from the Chen Pan Ling taijiquan form (a move called "step back and hit tiger with reverse fist") in precisely this manner: as a projection/throw. 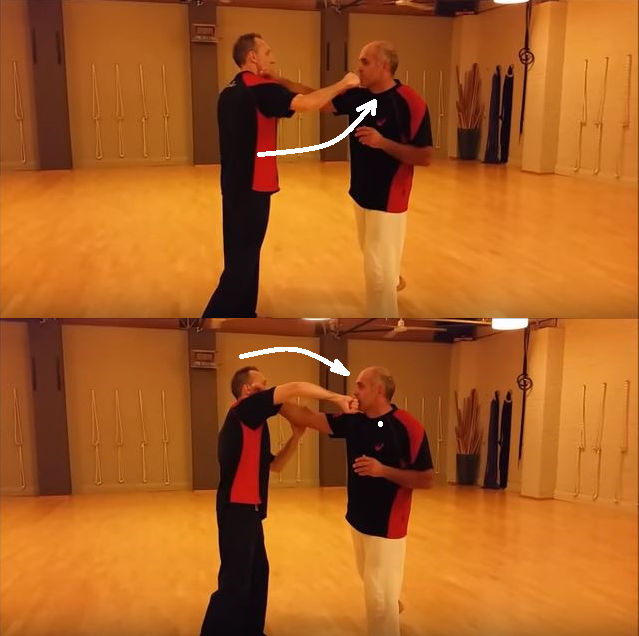 A further application in the above video shows you just how effective the technique is in "cutting the supply lines" of your opponent's punch by striking his or her chest. Ultimately, there is actually no end to the versatility of this, rather under-used, punch variation. 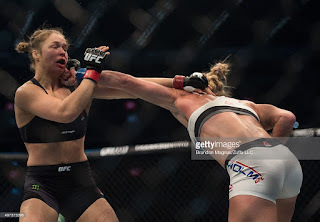 Apart from shaking up the women's MMA world, I'm glad Holly Holm came along and shared her particular use of this technique and others. It just goes to show how one fighter can make you re-examine old ground in new light. See also my follow up article: "Overhand inverted punch as simultaneous deflection"
1. Note my next article in relation to naming conventions. 2. It's interesting to note that Rousey not only fell prey to a corkscrew punch; her punches had practically no corkscrew at all. I'm guessing her coach is in the "corkscrewing is bad form" camp.